Pope Francis often urges us priests to accompany people who are in sinful or strained relationships with the Church. This frightens a lot of tradition minded folks because it sounds like just giving in and going along with whatever anyone is doing. In the Gospel reading for the third Sunday in Lent this year (March 19) we find the beautiful story of Jesus' encounter with the Samaritan woman at the well (John 4:5-32). In this story Jesus offers Himself as a beautiful example of what it means to "accompany". Jesus takes the initiative. 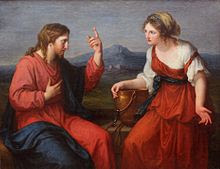 He breaks social taboo to speak with her and ask her for a drink of water. This was forbidden on several levels. First of all Jews did not speak with Samaritans. Secondly she was a woman. Men and women to whom they were not married had to keep a respectful distance in public. Jesus, however, breaks both of these taboos. Also, in asking her for a drink of water He is showing a willingness to receive from her before He offers her the great gift that He has to bring. He doesn't lead this meeting with confrontation and judgement, but with compassion and desire to listen. Only after establishing a connection with her does He tell her "to go and get her husband". When He finally tells her that she has five husbands she responds with amazement. She tells her Samaritan friends, "He told me everything I ever did." 1. She was thirsting. She was in pain and looking for a way out of her difficult life. 2. More importantly Jesus spoke and gazed upon her with such love that she was able to hear and take to heart His challenging words. Thus, she was set free and became a "missionary", carrying the Good News to her friends and neighbors. When we accompany people we are not condoning their bad behavior but rather meeting them where they are at, listening to them, compassionately responding to their pain and then leading them to the truth. Leading with statements of rules, etc often drives people away. As for ourselves, for what do we thirst? Are we open to the compassionate and yet challenging voice of Jesus? I live in a friary intended mainly for elder and retired friars. I am not retired myself and I am one of the young guys in my community, but I am certainly closer to the end of my life than to the beginning. I found myself asking the question, "So what does Lent mean after all these years. How can people who are getting along in years observe this special season?" Needless to say, like everyone else, we are supposed to turn to prayer, almsgiving and fasting. I would like to suggest thought that there is a particular framework that might be helpful for those of us who have lived through sixty, seventy, eighty or more Lenten seasons. The traditional formula for the imposition of ashes is the one in the upper left hand corner at the beginning of this article. I recent years we have also been able to use the words "Repent, and believe in the Gospel." Both formulas are fine and in my younger years I preferred the newer one. Recently, however, I have reverted to the older one. Why? There is the awareness that I, as well as other folks of my generation, are inching closer to "returning to dust." I believe that this awareness should shape our Lenten practice. Some might think this too gloomy and depressing a thought. Remember, as we move towards death we are preparing to give ourselves into the hands of a loving and merciful God. We should approach this reality with hope, rather than with dread. Besides meeting the obvious challenge of overcoming what is sinful inn our lives, I think that Lent is a good time at our age to let go of excess baggage. Perhaps things that served us well years ago, be they material things or ideas, attitudes and dispositions. need to be cast aside. We can be trapped into a "we've always done it this way" mentality. Maybe with the diminish of our bodies, with less energy, we have to learn to do many things differently, including prayer. It's amazing how many of us carry anger and resentment towards people and situations that are long past. During Lent we can ask the Lord to set us free from these things as well as negative attitudes and cynicism. Whatever our age Lent is not just about giving up things. It can be a time of new freedom, of doing things that we always wanted to do but did not have time for. As I go around preaching I am always impressed by the number of seniors who attend daily Mass and who give more time to prayer. Others with the energy to do so give more time over to service of others. Maybe one might be inspired to develop talents that you just didn't have time for at an earlier age. Naturally as we embrace this new freedom the decisions we make can take us well beyond Lent. It is difficult to face the reality of decline. Denial can be a big problem as we grow older. We like to stay in control and be able to do the things we always did. It is hard to admit that "I am getting older and can't see, hear and move about like I used to. Lent can be a time of asking the Lord to help us accept that. If we do that we will be doing a great service to those who care for us. 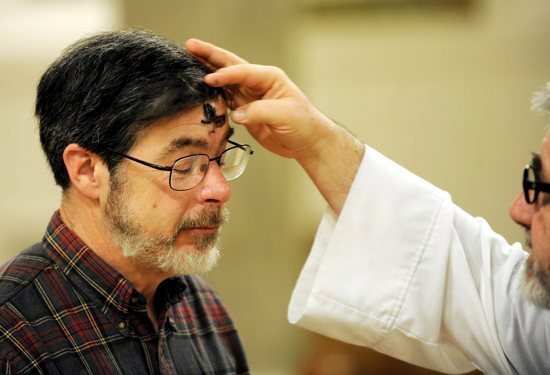 One final Lenten practice could be growing in the ability to graciously receive help. As Americans and as Christians we were trained to give. That is good. We don't want to be takers or fall into a habit of entitlement, Receiving is not entitlement. It is humbly receiving as gift what others are willing to do for us. It is admitting that we at time need help rather than stubbornly insisting that we can still do things that we are no longer capable of. I am moved by the fact that many of the men where I live need help getting around, and so graciously receive the offer to assist them. I know that when I have to give up my car keys to the superior for my sake and the sake of others on the road, that will be a challenging moment. 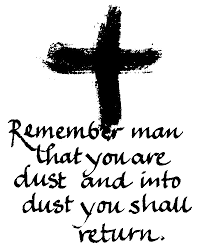 Remember, you are dust, and unto dust you shall return. That's OK. That's good news.